So I said I had a quilt to show you right? Well here we go! I had some logistical issues getting pictures of this quilt because my neighbours got a second car and now park it in front of the fence that I use for my shots; last week I literally had the quilt in my hands ready to go downstairs and take my photos when my neighbour pulled in - very frustrating! But I finally got some when the car was moved for a bit - woot! This quilt was made as part of a challenge for the Toronto Modern Quilt Guild; as you all know I'm President of the guild and a few months back Robert Kaufman offered us some Kona charm packs to do a challenge. Of course I jumped at the offer and selected charm packs in the dusty palette for the guild; I set out the challenge rules so that each member person could only use up to one yard of one other fabric in their quilt top (binding and backing were extra) and selected this palette because I thought it would present a nice challenge for picking the one contrasting fabric. This is the design that I came up with - I used 36 of the 44 charm squares (the other 8 charm squares didn't have enough contrast with my chosen solid) and paired them in sets of four like tones. I didn't want to cut the charm squares down too much because I wanted the quilt to be as big as possible without going over my one yard contrast fabric limit so I went with a very simple design. Each of the blocks are rectangular rather than square (finishing at 12x13") which I think adds interest to the top. 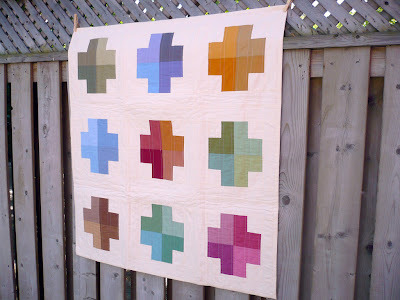 I decided to called this design Colour Block Cross and will be donating it to charity; I was originally going to donate it to the chapter of Project Linus in our area but they don't want it (don't even get me started) and we've had an issue with them as a guild in the past (ugh). I really love this quilt though and the colour blocks make me super happy! I really hope that it finds a home with a child who will be comforted by its warmth and who will love and hug it fiercely! Oh, and you should all head over to Kate's blog to see some darling pictures of little Grace in the cardigan I knit her! It finally arrived in Australia after being in the mail for three months (eeek!) - we thought it was lost but it got there and luckily Grace is still small enough to wear it, hurray! This is gorgeous! What a wonderful way to use charm squares. Thank you so much for the inspiration. it's so pretty! 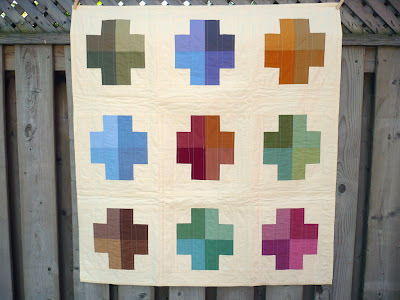 looks just like the modern crosses quilt from the modern log cabin quilting book! I love it Kaye, it is beautiful. Beautiful layout!A terrific idea for a challenge. That is a great design Kaye! What is your background fabric colour? I'm shocked that they don't want your quilt at Project Linus (is it the wrong size?). I really love it! What is that background colour? It looks kind of pink in the second photo. I can't believe a charity wouldn't want this quilt?!? wonderful! I've been exploring crosses too and this one's really nice! I love the way you combined colors for each cross. What a great design! I love your choice of background fabric, too. It should make its new owner very happy!! It's awesome, Kaye! I LOVE it!! Oh, I do love the simplicity of your design, and I love the cream background (am I correct? is the background cream coloured?) It look wonderfully fresh with the solids. Greetings from Fraser Valley, British Columbia. Wow, I really love your quilt! 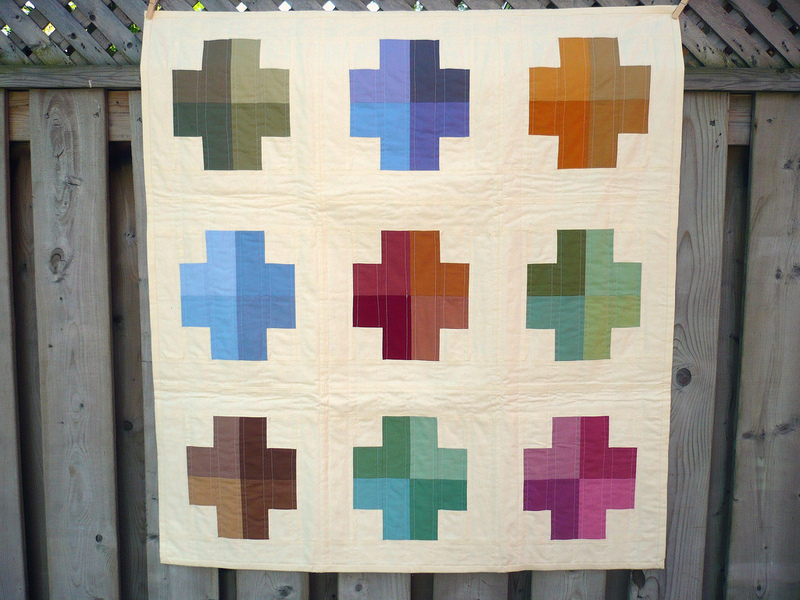 Arrived at your blog after searching Google for "cross quilts." 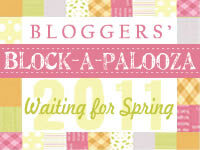 By the way, did you ever start the quilt along for this quilt? If you did I will find it, and if not I hope you still consider starting it. Get Stacked - a Custom Pillow Cover! Happy Canada Day - a little late!